The news encircling around the web about the engagement of TV-host Bianca Gonzalez and JC Intal that were been sweetheart for three years already. 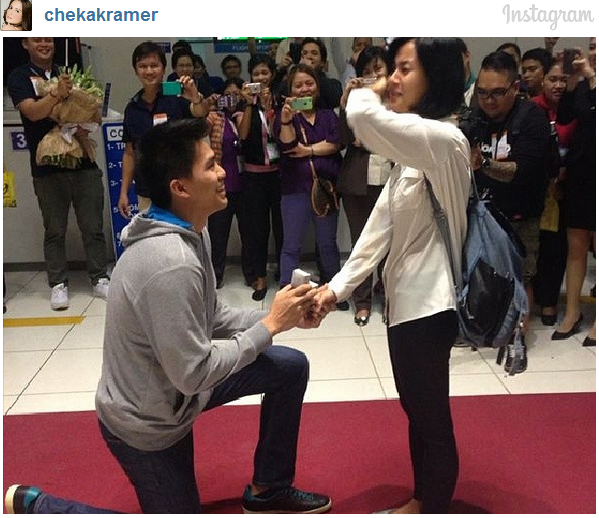 The basketball star, JC Intal, asked Bianca to marry him which is unexpected according to Gonzalez. The proposal takes place at the Ninoy Aquino International Airport Terminal 2 early Thursday morning, March 20, 2014. As stated by Bianca that was aired on "Buzz ng Bayan" Sunday, she was totally no clue of said proposal due to huge misunderstanding a week prior and she that was her fault. She turned 31 last March 11, 2014 that's why it wouldn't sound completely strange to hear they get married soon. Year 2011 when they started their mutual relationships and now they were engaged then soon get married. Bianca revealed that being with JC is her wildest dream. She looks so happy and excited for that day they'll become an officially married couple by November or December this year. In behalf of this blog authors, we are happy for both of them. We hope that you both get contented to each other and be fruitful and keep making history in entertainment and sports industry.